The Development Collaborative Assessment and Feedback Engine (DevCAFE) directly engages participants in collective assessment of local conditions, needs, and outcomes. DevCAFE is an interactive platform that provides participants with preliminary insights from the data collected in their communities by combining peer-to-peer review with statistical models to streamline and structure participant feedback. DevCAFE was used to collect feedback from 137 women in Kamuli, Uganda in June 2014 to assess the effectiveness of family planning education trainings. A modified version of DevCAFE featuring a visual- and voice-based user interface was deployed in Kamuli in June 2015. DevCAFE is currently being implemented in the Philippines to crowdsource improved disaster risk reduction strategies. 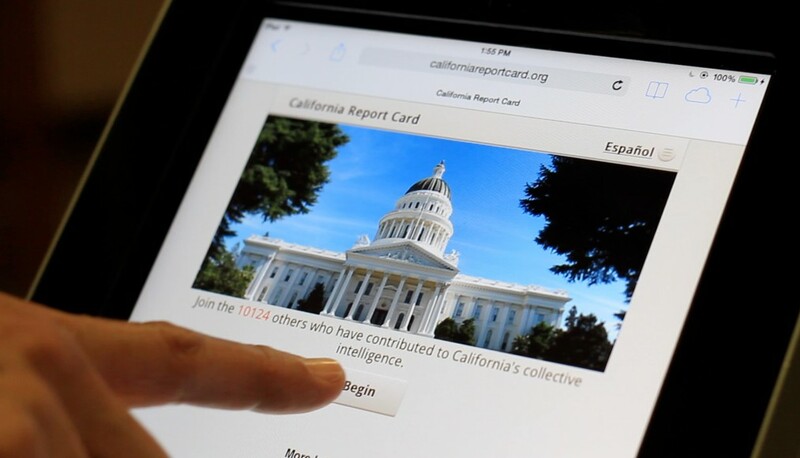 The California Report Card is a bilingual (Spanish & English) online platform developed by the CITRIS Data and Democracy Initiative at UC Berkeley and the Office of Lt. Governor Gavin Newsom. The California Report Card allows participants to assign grades to the state on timely issues, suggest issues for increased priority, and evaluate other participants’ suggestions. Since its launch in February 2014, more than 13,000 Californians from all 58 counties have assigned more than 50,000 grades and suggested topics for future Report Cards. QuakeCAFE (quakecafe.org) is a web-based platform that combines peer-to-peer review with statistical models to streamline and structure public feedback. The platform facilitates self-assessment of disaster preparedness, provides feedback about ways people can better prepare, encourages participants to suggest ideas for ways the California State government can improve earthquake preparedness, and allows participants to rate the usefulness of each others’ suggestions. QuakeCAFE emerged from the California Report Card (californiareportcard.org), an English and Spanish mobile platform that allows participants to assess and give advice on timely policy issues at the state level. Over 22,000 participants from all 58 counties have assigned over 40,000 grades and suggested over 500 issues for increased priority. Among these, disaster preparedness generated consistent interest across the State, prompting Lt. Gov. Newsom to encourage CITRIS to develop QuakeCAFE. QuakeCAFE is free to use, works on any mobile device or personal computer connected to the Internet. Quake CAFE is a collaborative effort between the Connected Communities Initiative at the Center for Information Technology Research in the Interest of Society (CITRIS), based at UC Berkeley and the Office of the Lieutenant Governor of California. Mexican citizens will go to the polls in June 2015 for important mid-term elections. To engage voters and alert them to topical issues, the CITRIS Data and Democracy Initiative is collaborating with faculty at Tec de Monterrey, and the Mexico National Electoral Institute to design and implement México Participa, an innovative civic engagement platform that aims to increase public engagement with political issues and help leaders at all levels stay informed about the changing opinions and priorities of their constituents.